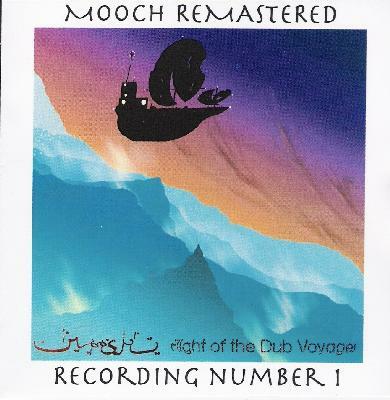 Mooch - "Flight of the Dub Voyager"
Recorded in 1996, Flight of the Dub Voyager is the first in a planned series of remastered versions of Mooch music never before released - except, in a small number of cases, as one-off private releases. The music is compiled from two sessions. The first includes all five band members: Terry Bartlett (treated guitar, percussion), Cal Lewin (keyboards, bass), Garry Lewin (keyboards, percussion), Steve Palmer (keyboards) and Phil Watson (percussion), and the second with just Steve, Cal and Garry. The music is split into 12 parts, but was edited and merged by Steve to create a continuous hour of music. From the beginning the music takes off into interstellar ambient space, but the bass and percussion give it enough of a rhythmic pulse to propel the music into rock territory. Call it ambient space rock. With nearly everyone contributing keyboards you know there's lots happening. But Mooch excel at being busy and multi-layered, yet subtle, well crafted and never overdone. And as you settle in (headphones required!) you'll quickly realize that you've indeed bought a ticket on the dub voyager's flight. Cool cosmic grooves, mind bending atmospherics, deep space keyboards (both analog and digital), alien electronics, and some high intensity symphonic moments that will appeal to prog rock fans. It's a breathtaking trip which you'll easily get lost in. For more information you can visit the Stephen Palmer web site at: http://www.stephenpalmer.co.uk. In addition to Mooch you'll find information on Steve's Blue Lily Commission recordings (see review this issue) and his published science fiction novels.